When you know there is something more interesting hidden in a photo, what do you do? You open Photoshop and start playing! This is the original photo. 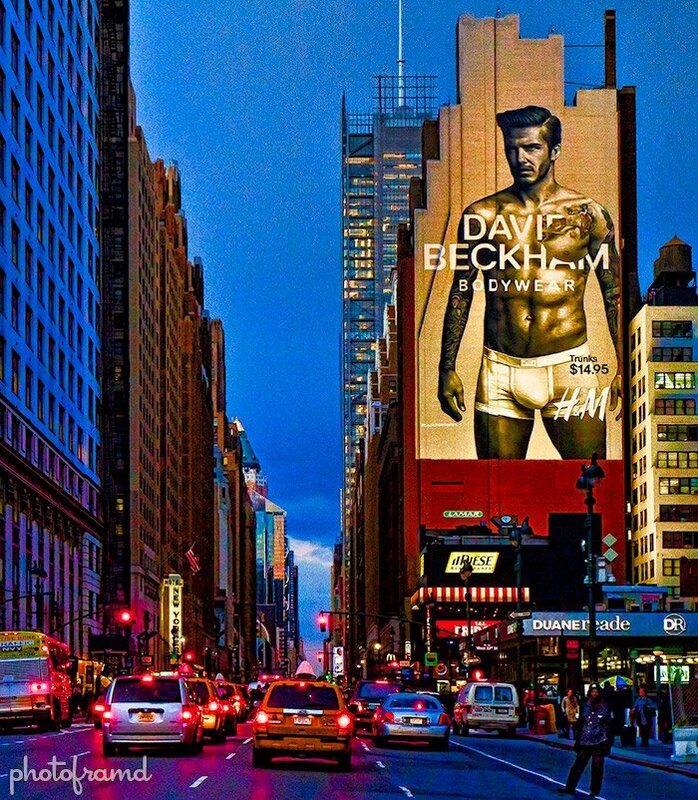 H&M posted a building size photo of David Beckham to promote his new underwear line during Fashion Week. After passing it several times, I decided to take some photos with my Canon 7D. I could have used HDR to bring out the details, but I was looking for something new. The first photo in this article is my final composition with plenty of punch. The technique involved layering multiple effects generated through Topaz Labs plugins. It’s a little grungy, a little colorized with plenty of saturation. 1. Start with a sharp B&W Grunge conversion. I duplicated the original layer in Photoshop CS5 and brought it into Topaz Adjust 5. I applied my Grunge Me BW to the photo. (My preset now ships with Topaz Adjust 5.) It generates a very sharp B&W image with a cool grunge effect. This layer will be my starting point. 2. 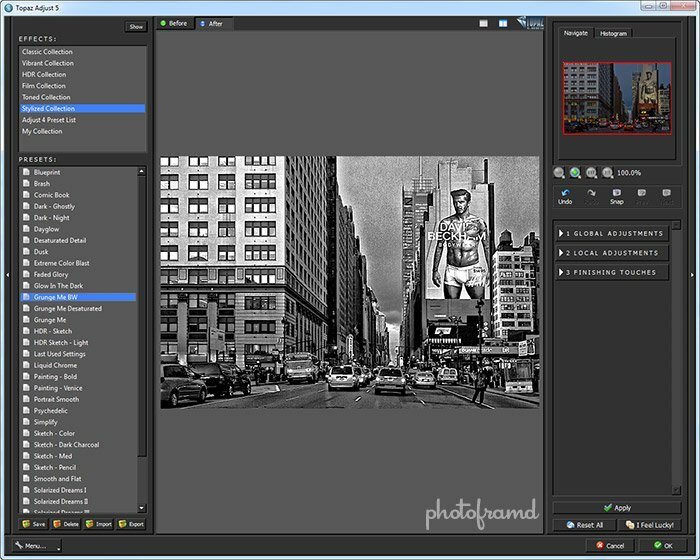 Use Topaz Clean 3 to remove details but keep sharp edges. Before Topaz Clean, I would have used Gaussian Blur to build my colorizing layer. The goal is to reduce the photo to just flat colors which can be further manipulated. However, Gaussian Blur would not retain the sharp edges and ends up painting outside “the lines”. 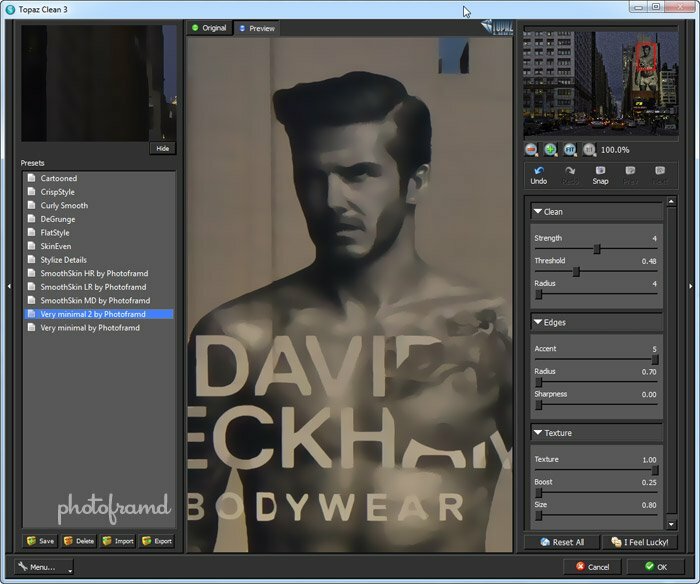 Topaz Clean 3 does exactly what I need – removes the details but retains sharp edges! And yes, you can download my two zipped (compressed for you Mac users) presets for Topaz Clean 3 called Very minimal by Photoframd. There are two different presets depending on the strength that you need. But, both presets will also remove digital noise since the pixel setting is set so high. 3. Use the Cleaned Layer in Topaz Adjust to create the color layer. I next duplicated the layer cleaned by Topaz Clean and launched Topaz Adjust 5. My goal is to create a highly saturated color layer to apply on top of the B&W Grunged layer. 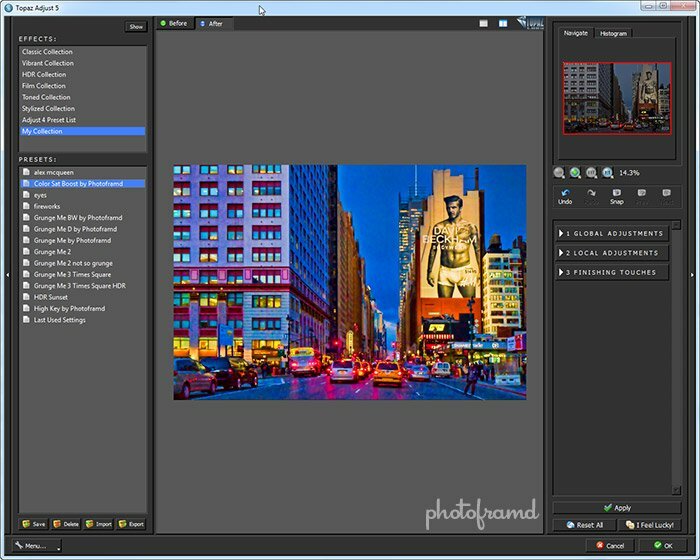 You can download my zipped Topaz Adjust 5 preset called Color Sat Boost by Photoframd. It oversaturates the real colors to produce a very punchy effect. But, the colors are still based on the real-life colors … just taking them to an extreme. 4. Now for the Layering. The color boosted layer (of the cleaned image from Step #3) is layered on top of the B&W grunge layer (from Step #1). 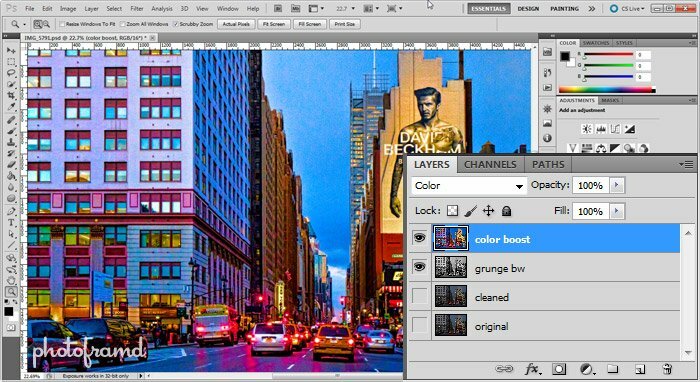 The Blending mode of the color boost layer is set to Color with 100% Opacity. If you like this effect, you can stop here. 5. 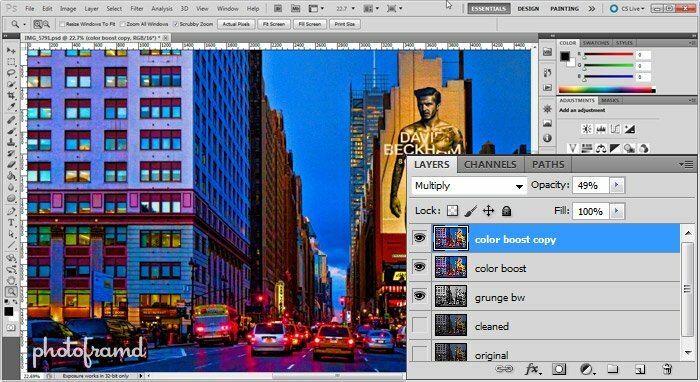 Duplicate the color boosted layer to darken colors. I copied the color boost layer (from Step #3) again and changed the Layer Blending to Multiple with an Opacity of 49%. This extra step will deepen and darken the colors. The final effect is very unique. If you are looking for something different (that is not HDR), give this technique a try. I will have a few more photos with this technique later in the week.